Late-season flowers are derisively considered “weeds” by many people, which downplays their beauty. One such plant that shouldn’t be overlooked is butter and eggs. 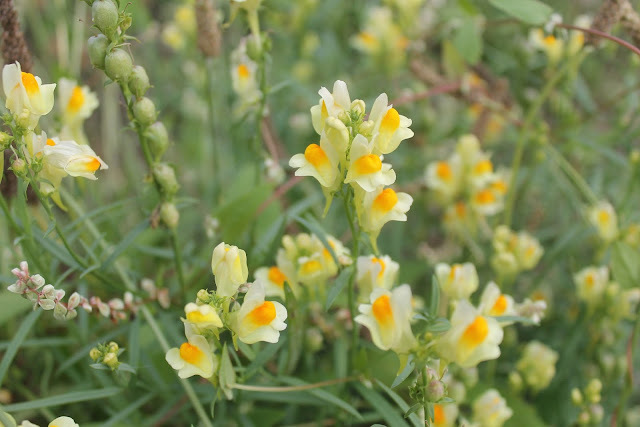 This invasive species also goes by the name yellow toadflax and wild snapdragon and makes itself known in late- August and will be in bloom till the end of September. The plant has a unique, tell-tale flower structure. It’s not a typical, circular ray as you would see on many fall wildflowers like asters, evening primrose, or hawkweeds. Instead, it possesses the unique look that gardened snapdragons have. There are 4 yellow petals (butter) that surround an orange center petal (eggs). That orange center acts as a beacon to pollinators, the most common user of the plant being bumble bees and any species of moth that has a huskier body. You won’t see butterflies actively feasting on the flowers because the insects that do so have to be strong enough to lift open that heavy central petal. You will find the plant in pastures, but more commonly along dry disturbed sites, like roadsides, ditches, bike trails, and hedgerows. It’s a hardy plant and a colonizer, spreading not only with rhizomes but also seeds that can last for years. Butter and eggs make a nice addition to your kitchen table. But, unlike their namesake, not as foodstuff. The attractive flowers make wonderful centerpieces and lasting ones…they will stay healthy for days in a vase, rather than quickly wilting away as so many flowers do. This plant has proven medicinal purposes as a diuretic and a fever reducer. Historically, it was even used to treat rashes and other skin ailments. It’s not so kind to cattle as they can get intoxicated from feasting on the leaves. Appreciate these flowers while you can. They will be done blooming in a few weeks, the brown of fall will come as will the snow and you’ll be wishing that there will still “weeds” around to brighten the landscape.